DETROIT — Kia took the top spot in J.D. Power’s annual report card on vehicle quality for a second consecutive year, as industry ratings reached a new record and domestic brands maintained their edge over foreign rivals. Kia, with 72 problems reported per 100 vehicles, was able to retain its No. 1 position despite a shake-up in the 2017 U.S. Initial Quality Study rankings that included significant shifts with the German and Japanese brands — most notably, Toyota and Lexus — falling behind many U.S. and Korean brands. In its first year as a standalone brand, Hyundai’s luxury Genesis brand debuting at No. 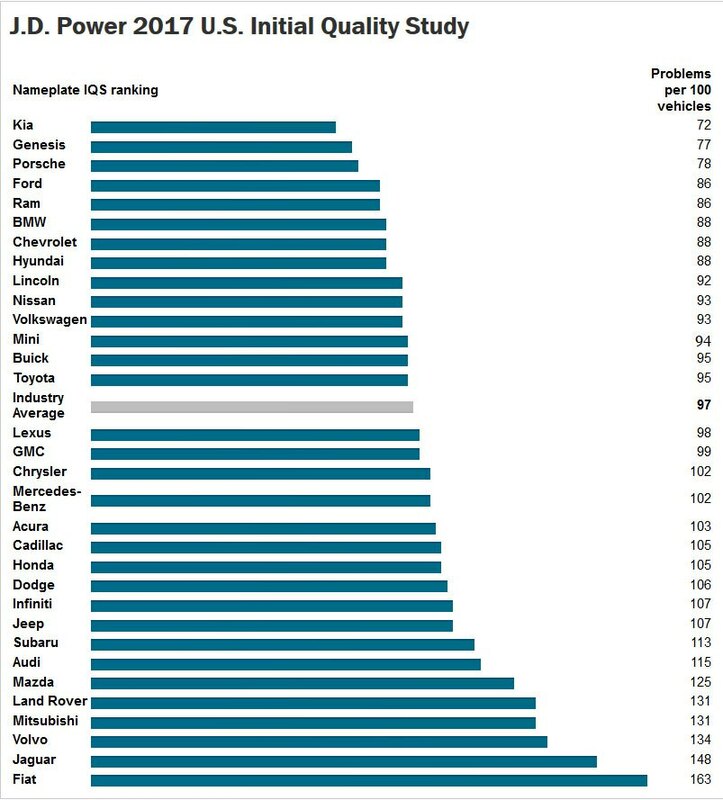 2, with 77 problems reported per 100 vehicles. Porsche, with 78 problems, dropped to third — its lowest ranking since 2015. Ford and Ram, both with 86, rounded out the top five brand positions — marking the highest positions in the study for both brands and the first time since 2011 that two Detroit brands have ranked that high. Sargent said Ford’s improvement, up from 11th in 2016, was largely because of its new Sync 3 infotainment system, a replacement for its previous Sync and MyFord Touch system that plagued the brand’s rankings in recent years. Improvements to infotainment systems greatly helped brands from the Detroit automakers outperform import brands for the second year in a row, according to Sargent. In 2017, domestic brands received a score of 93 compared with 99 for import brands. It’s just the third time since the study was first published in 1987 that domestic brands outperformed their foreign counterparts. Toyota’s brands, which for years led or were ranked near the top of the study, had mediocre performances this year, with Lexus ranking one position below the industry average and Toyota ranking one above it. This was the first time in the history of the survey that Lexus scored below average. Nissan, with a score of 93, was the top-ranked Japanese brand at No. 10 — level in the rankings from a year ago. At the very bottom of this year’s rankings were Mazda, Land Rover, Mitsubishi, Volvo, Jaguar and Fiat — all with between 125 and 163 problems reported per 100 vehicles. Many of the low rankings, according to Sargent, are due to the brands launching all-new products, which tend to have more quality issues than older, more refined models. New-vehicle quality overall for the industry reached a new record, improving a significant 8 percent from last year’s previous record-setting year. The industry average for the 2017 study is 97 problems reported per 100 vehicles, down from 105 a year ago. The only category to worsen this year was features, controls and displays. The largest increases in problems were for cruise control (primarily adaptive cruise); lane-departure warning; collision-avoidance/alert systems; and blind-spot warning. The study was based on nearly 80,000 responses from owners and lessees of 2017 model-year vehicles after 90 days of ownership. Consumers were surveyed from February through May. Hyundai Motor Co., which includes Kia, was awarded the most model-level awards. 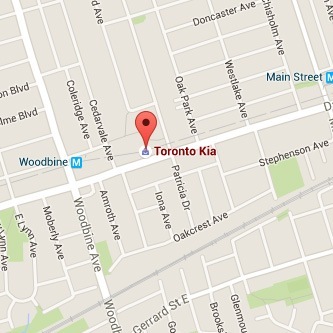 They included the Kia Cadenza; Kia Forte; Kia Niro; Kia Sorento; and Kia Soul. Following the South Korean’s five awards were General Motors Co. (Chevrolet Silverado; Chevrolet Silverado HD; Chevrolet Sonic; and GMC Terrain) and BMW Group (BMW 2 Series; BMW 4 Series; BMW X6; and MINI Cooper) both with four awards. This entry was posted in Awards & Accolades on June 22, 2017 by Administrator.